AtlasQuest development is presently on hold. The Atlas mod hasn't added Battle for Azeroth dungeon maps yet, so any work I do to add quests for the new expansion wouldn't be visible. Additionally, I haven't really been playing that much lately. I'm not sure how long it'll be on hold or if I'll ever resume development. I have been strongly considering making a release for WoW Classic when that's available though. We'll see. 2007 it has been maintained and updated by Thandrenn (aka Mystery8). tried to make note of them in the changelog.txt where possible. or from websites such as WoWhead.com or WoWpedia.org. 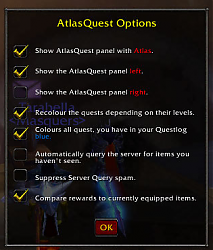 NOTE: The addon "Atlas" is required to run AtlasQuest. Visit the following link to download Atlas and all of its modules. - Patch 8.0 & Battle for Azeroth preparation. No content changes yet. - Minor fixes for a few quests. - Updates to German translation. - Bug fix for Return to Karazhan quests. - TOC file updated for Patch 7.3. - Fixed quests not showing for The Deadmines, Scarlet Halls, Scarlet Monastery, Shadowfang Keep and Scholomance. - Blizzard now includes the name of the dungeon or raid with the quests. This was causing some text alignment issues with so many quests, so I removed the Dungeon names and just kept the quest names for each quest. Will break the code that detects if you're on a quest until I can re-work it. - Added support for Cathedral of the Eternal Night dungeon. - TOC file updated for Patch 7.2. - Additional updates to German translation. - Updated map file names a bit for Atlas 1.39.00. - Basic support for Tomb of Sargeras. No quests yet. - Fixed a bug in the German language file that was causing a LUA error on load. - These updates are for the English translation. German updates are pending. - Removed the following Obsolete / Unavailable quests from the Warlords Legendary Questline. - Fixed a few bugs in German translation to keep LUA errors from popping up. - NOTE: Karazhan quests are temporarily viewable by clicking on The Nighthold Entrance map until Atlas adds a map for Karazhan. - German translation updated, but not complete. Still a work in progress. 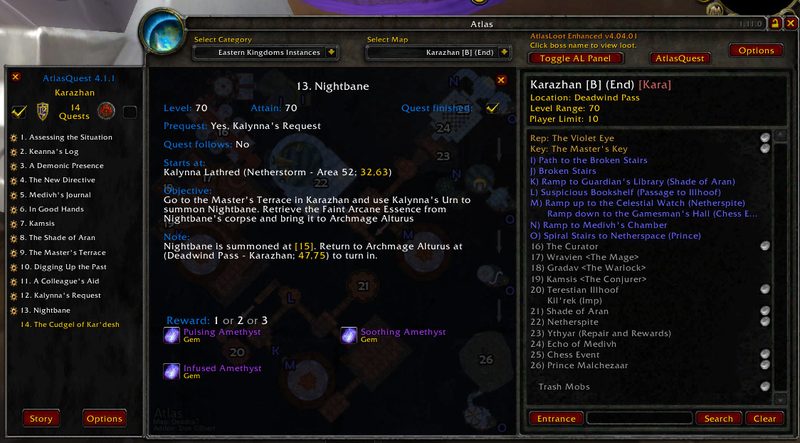 - Removed Non-Mythic Quests from Court of Stars and The Arcway. These quests don't seem to actually exist. Not sure why Wowhead lists them. - Updates for Atlas 1.34.02 changes. - NOTE: German translation not yet updated. It is being worked on. - Black Rook Hold: ... With Fire! - Vault of the Wardens: How'd He Get Up There? - Updated AtlasQuest panel location for Atlas 1.33.02. NOTE: Atlas may incorrectly mark this version as obsolete and disable it. The Atlas Team will be correcting this shortly. - Added early support for Legion Dungeons and Raids. Quest data not complete yet. - Split English & German localization files up. No visible difference to users, but makes it easier for the translators. - Some code cleanup. Mostly removing more support for the ancient and dead AlphaMap addon. - Removed Warlods of Draenor Challenge Mode quests. - Updated a few quest rewards that are now Toys. - BUG: Stratholme quest "Liquid Gold" now correctly moved to Stratholme: The Gauntlet. Thank you yunohu for letting me know. - NOTE: Only the English translation was updated. German translation is pending. - Updated map file names for Atlas 1.32.00. - Added Hellfire Citadel and quests. - Both English and German localizations are updated. - The New Horizons probe arrives at Pluto today. Yay! - Updated Garrison quests which now require the last boss in the instance to be killed. - Fixed bug with Level 100 quests always being colored blue, even if not in quest log. - NOTE: Only the English localization is updated. German update is still pending. - Updated quests for Blackfathom Deeps, Razorfen Downs and Razorfen Kraul (revamped in 6.0.2). - Removed Mists of Pandaria Legendary Cloak quests that were removed from the game. May the rest in peace. 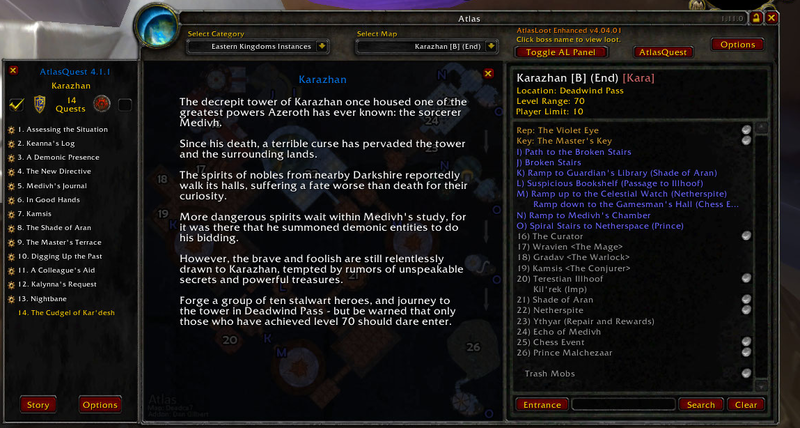 - Added all known Warlords of Draenor dungeon quests. If I missed one, let me know. - Grimrail Depot: And No Maces! - Upper Blackrock Spire: For The Children! - Removed all references to Justice and Valor points. May they rest in peace. - Moved Options button a little bit more to the center. - Warlords of Draenor quests will be added in the next release. I don't have enough information for them at this time. - Fixes in deDE localization. - Translation files for Simplified Chinese, Traditional Chinese and Russian are no longer being loaded. They haven't been maintained in over a year. The files will remain in the release however, in case anyone wishes to use them. - Fixed a few boring typos. - Special thanks to Burkhard for reminding me of these quests I forgot to add. Thank you! - Stormstout Brewery: Is That A Real Measurement? - Siege of Orgrimmar: Why Do We Fight? - Added support for Siege of Orgrimmar. - Support for new Scenarios and Battleground. No quests for them though. - Just updated TOC file for Patch 5.2 and added basic support for Throne of Thunder raid. No new quests needed to be added. - Removed obsolete "Into the Nexus" quest. Thanks yunohu! - Removed some obsolete Pandaria quests that never made it into release. - Removed Keys, Relics and Thrown weapons from quest rewards. - Fixed AtlasQuest button not showing up in Atlas. Thanks Washakie! - Updated TOC File and added basic support for Mists of Pandaria dungeons, raids and battlegrounds. - Removed "Story" button. Blizzard's ingame Dungeon Journal replaces this much better. - The Gate of the Setting Sun: That's a Big Bug! - Fix / clarification in Dragon Soul quests: Cluster Clutch and Sharpening Your Fangs. - Fixed bug on showing color of item names for quest rewards. - Removed old "Call to Arms" battleground daily quests along with 2 other obsolete Alterac Valley quests. - Alterac Valley map locations updated. - Coordinates for a number of quests are now more accurate. - Added Dragon Soul Rogue quests. Not all quests are added. Just those that require action inside the raid. - Added Firelands Legendary Staff quests. Not all quests are added. Just those that require action inside the raid. - Patch 4.3 introduced a number of changes to Burning Crusade and Wrath of the Lich King quests. These were updated. - TOC file updated for Patch 4.3. - Added End Time, Well of Eternity, Hour of Twilight and Dragon Soul. - Removed Alchemy specialization quests from TK: Botanica & CoT: Black Morass. - Hour of Twilight: To Wyrmrest! This version of Atlas Quest DOES NOT WORK with the latest Atlas Update. Atlas keeps disabling it. This was corrected in the most recent release of Atlas. They just released a new update today too. It shouldn't be happening anymore. Last edited by sisterbiglips : 11-13-15 at 01:47 PM. 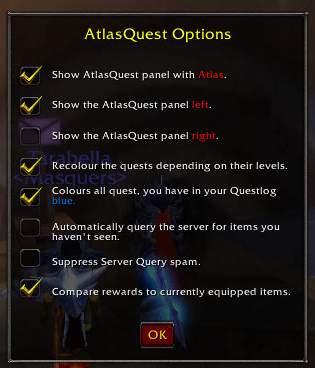 Now that Atlas has updated for 6.2, the AtlasQuest update can be released. I'm just waiting on my German translator to finish up, then it'll be released. If you're having problems using AtlasQuest, the most common problem is that you don't have Atlas installed. AtlasQuest requires Atlas to operate. If it's installed and enabled and you're still having problems, please let me know which versions of each you're using, what language your client is and specifically what is happening. Screenshots are pretty helpful too. Posting "It doesn't work" doesn't tell me anything useful, so i have no choice but to ignore those comments. Comments like this are extremely unhelpful. You leave absolutely no explanation of exactly how it does not work, what you've tried, etc. Please update this addon so it work with the latest version of atlas. CRASH THE HORDE TO BLOOD AND DUST. Thank you Found the problem and it'll be corrected in the next release. Looks like it's working correctly now. Maybe it was a fluke thing or maybe I had a corrupted download or something. Thanks for the addon and I'll let you know if it happens again. Error messages would be helpful if there are any.